More than 160 years ago, paleontologists found a partial fossil of a 70-million-year-old giant sea turtle, the only known example of its particular species. This week, they found the other half. Top image: Two partial fossil halves put together / via Drexel University. The second half was found by an amateur fossil hunter in New Jersey who donated it to the New Jersey State Museum. Seeing the similarities between this giant sea turtle and the Atlantochelys mortoni currently in the collection at Drexel University, they brought the two halves together to see if they had found a second example of the species. 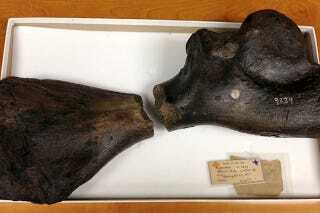 They were surprised to find that the two pieces fit together like a puzzle to form a single humerus. It wasn't just the same species, it was actually the same bone. Image: Jason Poole / via Drexel University.